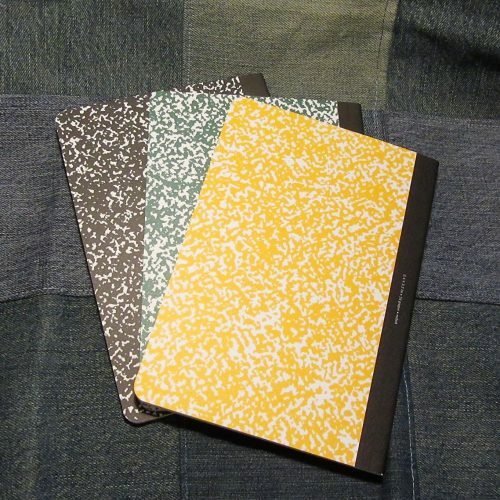 Here’s what happened, I love my composition notebooks but I was frustrated with the often nasty paper inside. 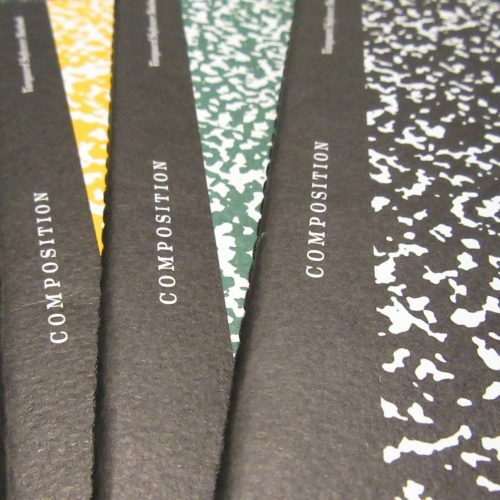 I thought, “You know who could make an awesome updated version of the composition book? 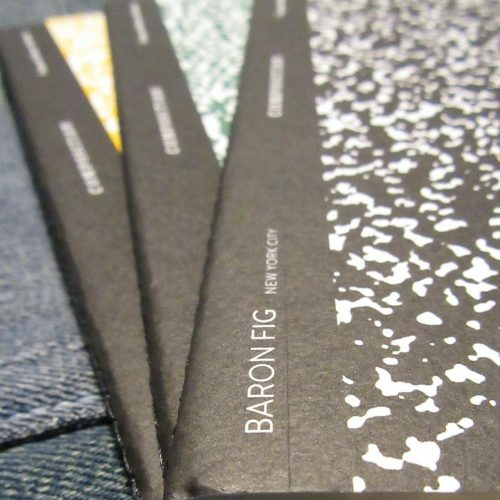 Baron Fig.” I picked up my phone and called Joey and Adam and told them my idea. They told me it was great and awesome. 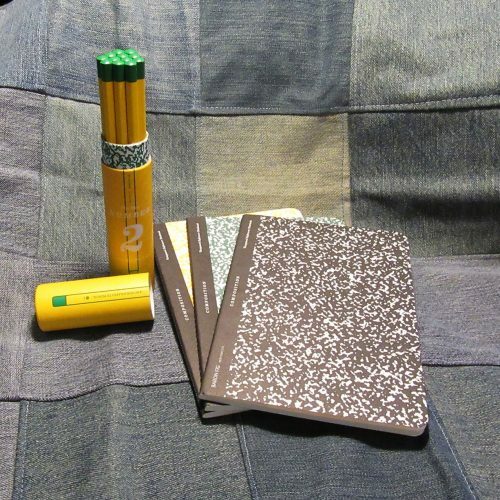 That they’d read my obsessive composition notebook review, then let me know when it was going to happen. 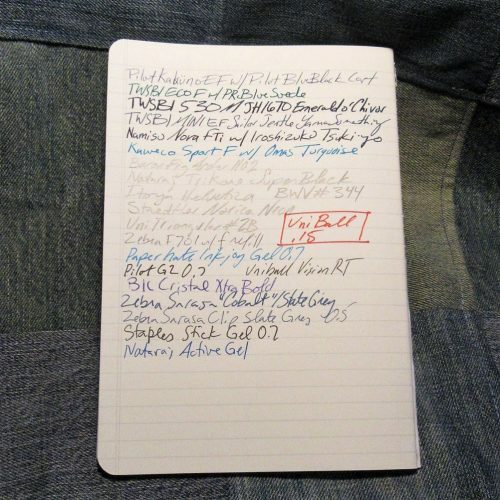 Okay, so that’s not really what happened, but it doesn’t hurt to think that maybe the guys over at BF read my obsessive reviews of composition notebooks. You know, where I harp on the amount of white to black in the marble and the size of the tape on the spine… I mean that probably didn’t happen either. 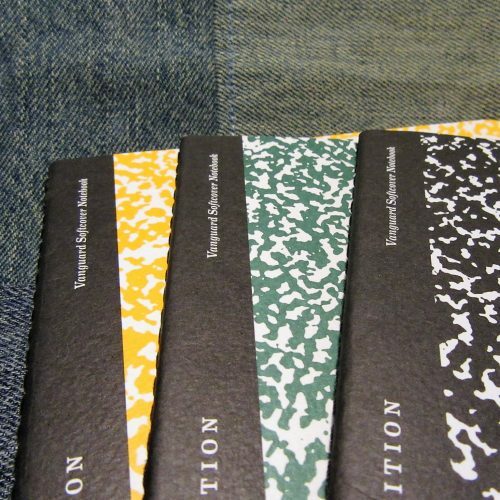 But these Vanguards feel like the guys at BF crawled into my head and put all my thoughts about awesome composition notebooks into play. The ratio of color to white in the marbling is great, the black “tape” on the spine is almost perfectly proportioned for the size. I’m just so in love with the cover style. They even fit my requirement that the spine is stitched. Inside is that great toothy but smooth enough for fountain pen paper. 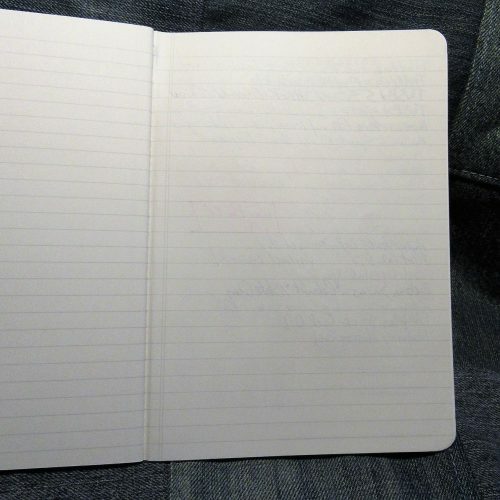 The Vanguard paper seems to be a tad thinner than the Confidant paper, but doesn’t feather with fountain pen inks. The flagship size is perfect for tossing into a bag, or if you must, the pocket of cargo pants. 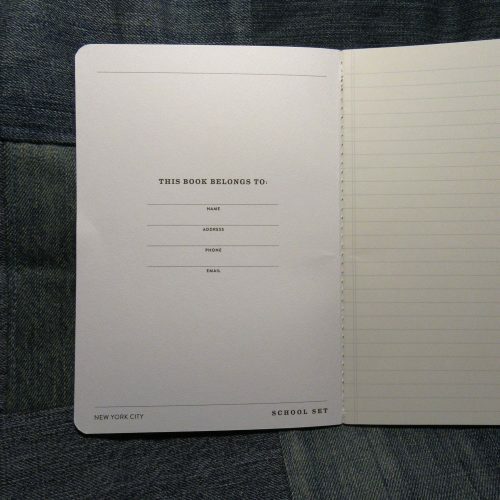 The only downside of these is that the cover is thin and not the stiff hearty cardboard comp books should be made from. Luckily they are a smaller size so the weight of the cover material is less important. 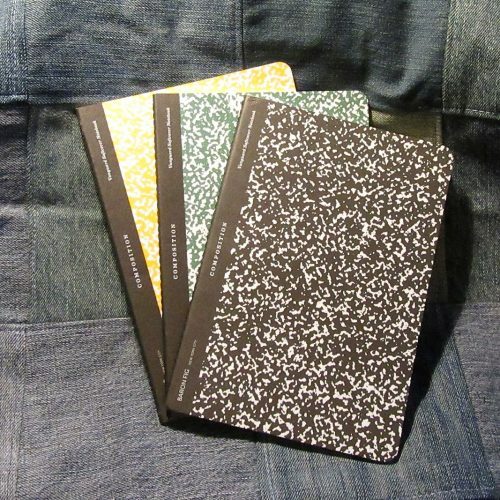 These notebooks are a fun miniaturized twist on the larger traditional composition notebooks. They look lovely with the Baron Fig No.2 pencils. Which I’ll review in their own post. Anyway, head on over the Baron Fig’s website to pick up a set. So some deeper fuller composition book analysis is needed here. Is this a comp book by my own standards? No. It is a good update on a comp book. It lacks a few things that I use to determine a true comp book- the size is too small (though there are mini and 6x9ish comp books), the spine is not taped, and finally the covers are soft and not card. It also lacks the standard generic label on the front. Even with all of that I love these. I’m glad they did this on the Vanguard and not a Confidant because this is the closest thing to a comp they offer. A marbled Confidant would not be in the tradition of comp books, in the same way that I cannot see the Kickstarted Comp as a composition book. 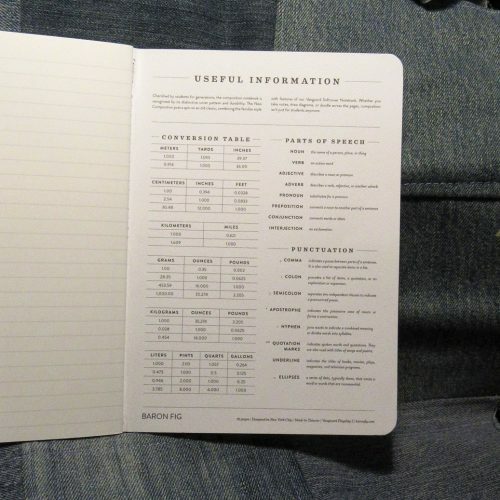 I think that the Baron Fig Composition is a good modern take on the old school composition notebook. This entry was posted in Review and tagged baron fig, comp, composition on 20171012 by leslie.